Posted on December 18, 2013 by EboniB. Brooklyn Brine is located on 574 President st, Brooklyn NY. 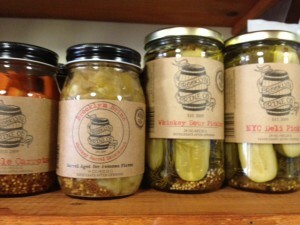 There are known for their uniquely flavor pickled vegetables, specifically pickles. Brooklyn Brine Co. was founded in 2009. However they have recently opened their Brooklyn factory in May of this year. Prior to Brooklyn Brine opening their very first factory, they were sharing production space with other businesses. Their pickles are barrel fermented in whiskey barrels from Finger Lake Distilling Co. Their pickles cost about $8 a jar and they also sell pickle kits which are $12 so you can make your own pickles.